social Media is a new beginning for the Capital. Social Media is a new beginning for the Capital! Home » Social Media is a new beginning for the Capital! 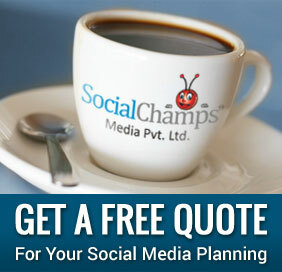 As the time has flown by,SocialChamps has grown 4 years older ,which is social media company stronger and bigger! We’ve been lucky enough not only to grow old but to grow old with some style! 200 brands with majority of them being international brands. isn’t that incredible? So far we’ve been focusing on international brands and a change is always called for with social media. for which we’ve decided to leave no stone unturned and reach out to as many new opportunities possible. Our team is all set for the challenges with all those wicked ideas trapped inside our tiny little brains. (No they’re not really tiny). As the world didn’t end in 2012 like that is social media, we came up with our survival plans, we thought of going bigger than just survival. We are happy +excited+ thrilled to announce that we are opening in Delhi too! This is surely a big step for all of us and all the credit goes to our beloved customers and fans who have believed in us and made us deliver better each and every time! Here’s a new beginning and many more growing years to come.